Are you tired of pouring cocktails that don't come out quite the same every time? Do you use premium olive oils that you don't want to go to waste because you poured for a bit too long? Do you enjoy creating awesome cocktails for your guests, and you'd like to be able to do it even faster and more precisely every time? Give Your Home Bar an Upgrade with this Stainless Steel Pourer Set from Chefast! Everything You Need: With eight pourers, ten covers, two picks, a cleaning brush, and a handy carry bag, this is a cocktail kit no home bartender should be without. Precision Pouring: It's an art and a science. These 304 stainless steel, professional-grade pourers will take care of the science part of that; all that's left is for you to dazzle your guests with premium cocktails made perfect every time. Cover Up: There's nothing nastier than a bunch of bar spouts left uncovered too long. Avoid that with these extra-long dust covers. Just snap them into place and no more worrying about fruit flies or anything else getting into your bottles. When Elegance Matters: You don't have to go all out and use a pick for every cocktail, but sometimes, that perfectly skewered pineapple or a few olives perched on top of a martini glass is the icing on the cake. Quick Clean: Spouts can be a pain to clean, but the included little brush makes the job a whole lot easier. Pick up and Go: The zipper bag lets you bring your setup with you to a friend, or ensure you've got all the pieces in one place. A Gift Worth Giving: Know anyone whose home bar is a little lacking when it comes to professional cocktail ware? They'll be dying to throw a party when you gift them this comprehensive pourer kit. Bartending is an Art; give Yourself the Tools You Need to Do it Well! **JUST ARRIVED** CRAFT COCKTAILS: Bring your home bar to the next level with this professional pourer set from Chefast. 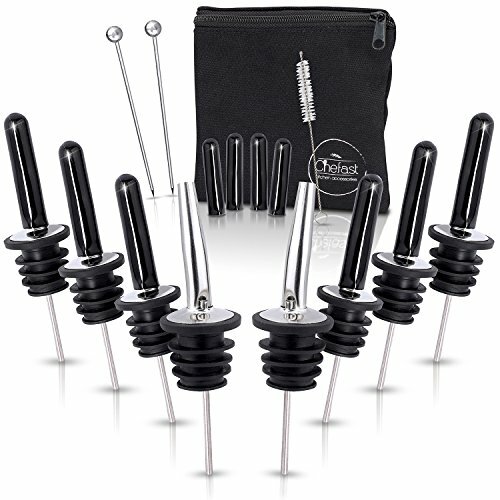 With eight pourers, ten long dust caps, two cocktail picks, a cleaning brush and a handy zip-up carry/storage bag, this must-have cocktail kit truly raises the bar for bar accessories. SPEED AND PRECISION: With eight pourers made from 304 food-grade stainless steel, you'll be pouring shots with confidence from your entire bar, from whiskey to rum. If you have a few extra, snap some of these spouts on your vinegar or olive oil bottles; they'll fit snugly onto most bottles up to 1L and won't degrade over time. KEEP CLEAN: We include 10 long dust covers that serve as a stopper to keep fruit flies, dirt, grime and other undesirables away from the tops of your bottles. These are significantly longer and durable than a typical cap, which prevents nasty residue from forming around the mouth of each bottle. EXTRAS THAT MATTER: Nothing says elegance like a stainless steel cocktail pick; no martini or tropical drink should be without one. The small straw brush makes cleaning the spout a snap; while the zipper carry bag means you can easily store your extra pourers and covers when you don't need them or take them with you to your vacation spot or the next party. 90-DAY GUARANTEE: With their sturdy construction, these ultimate bar accessories should last a lifetime. But if you're not thrilled with them, simply let us know within 90 days for a prompt, full refund. And if anything should happen within one year of purchase, we'll replace them free of charge. Click Add to Cart and transform your bar before your next mix-and-mingle!